The Li’l CRITTER™ High-Pressure Liquid Pump is used for light production and research applications that require a small flowrate at high-pressure. Standard units are available for discharge pressures of 10,000 to 100,000 psig (70 to 690 MPa) in frame sizes of 3 and 5 hp (2.3 and 3.8). Inlet pressure for these units is flooded suction. Standard process fluids are lightweight oil, water emulsion and other noncorrosive fluids. Stainless steel units are available for operation with water. These pumps can be customized for operation with other fluids upon request. Double-ended intensifer discharges in both directions of stroke. Pressure energized seals adjust automatically for wear. 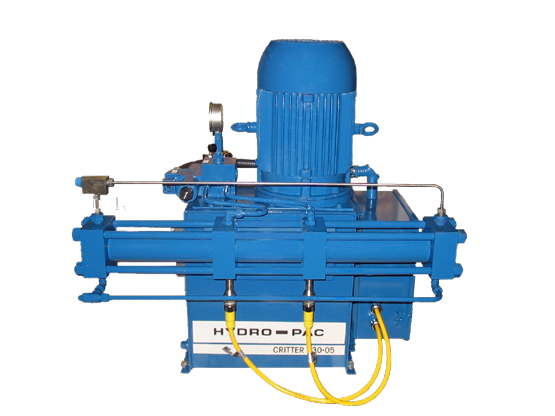 Water cooled hydraulic oil prevents over heating in continuous duty applications. Low interia hydraulic drive allows starting under full load conditions. Reversible valve seats allow use of both siders prior to replacements of the seat. Hydraulic power unit pressure limiter protects against over-pressurization. CRITTER PUMPS eliminate the need for a large compressed air supply since they are electro-hydraullicaly driven. Options for flammable or speciality fluids available.